New Delhi [India], Oct 12 (Newsvoir): India's only impact investing industry body Impact Investors Council (IIC) kicked off its second edition of impact investing conference Prabhav 2018 (7th - 10th October) in New Delhi. Prabhav was attended by more than 300 delegates from India and other countries including over 50 global impact investors. The conference aimed to showcase how Impact Investing in India goes hand in hand with Sustainable Development Goals (SDGs) of the United Nations. Over 100 meetings were conducted between Limited Partners (LPs) and General Partners (GPs) from India, the US, Japan and Europe. 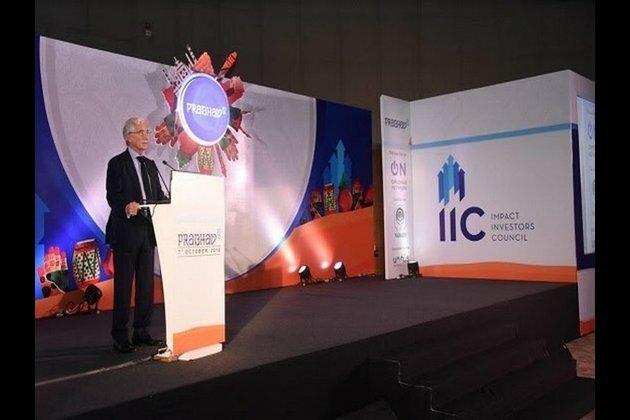 The inaugural session was chaired by Sir Ronald Cohen, Chairman, Global Social Impact investment Steering Group (GSG), where he spoke of impact investment's crucial role in inclusive growth in India and how it will help achieve the United Nations Sustainable Development Goals (SDGs). Chief Executive Officer, IDFC Bank. Geeta Goel, Country Director, Dell Foundation and Chairperson Impact Investors Council said, "Prabhav 2018 have established itself as the largest global platform of LP-GP meetings in Impact investing space, over the course of 2 to 3 days between IIC Prabhav and GSG summit, over 200 LP-GP meetings have been arranged and the feedback we are getting is that these meetings being held in India actually makes the decision much closer to the ground and much more important." Roopa Kudva, Partner, Omidyar Network said, "The growing influence of and attendance at Prabhav is a testimony to the appetite of the impact investment community in India to constantly learn from each other and from those around the world. I also hope that as a result at forums like this, we see more partnerships between Indian and global partners to serve and benefit those who have been traditionally underserved, excluded and disempowered." Chief Executive Officer, IDFC Bank said, "The sooner we all realize that returns are not just about financial returns but about also making a difference to the society, the sooner we realize the importance of our businesses and the continuation to delivering social returns the better off and more sustainable we will be, especially in India where capitalism, markets still do not have full legital credibility and belief among the general public, it is vitally important to those of us who believe in the power of markets to expand the horizon of market participants to think about things other than just pure financial returns that is the importance of Impact investing and that is why it is the future." Co. said, "IPCC findings serve as a reminder of the urgency of the climate change agenda. If we are to mobilize our resources at scale to meet the SDGs, we will require a shift to "impact economies" where countries and companies develop impact accounts. It's no longer sufficient to talk about what we need to do more of. It's time to understand what we all need to do less of." During Prabhav, there were nine parallel sector tracks meetings which focused on the issues of housing, agriculture, education, financial inclusion, energy, affordable health, skilling, sustainable cities, women empowerment and impact measurement. Hygiene Team Lead, USAID; Affordable and Clean Energy led by Avishek Gupta - Investment Director, Caspian; Sustainable Cities and Communities led by Ajit Pai, Consultant, Vice Chairman, Niti Aayog and Impact Measurement led by Emily G Wright - Fellow - Global Economy and Development, Center for Universal Education.